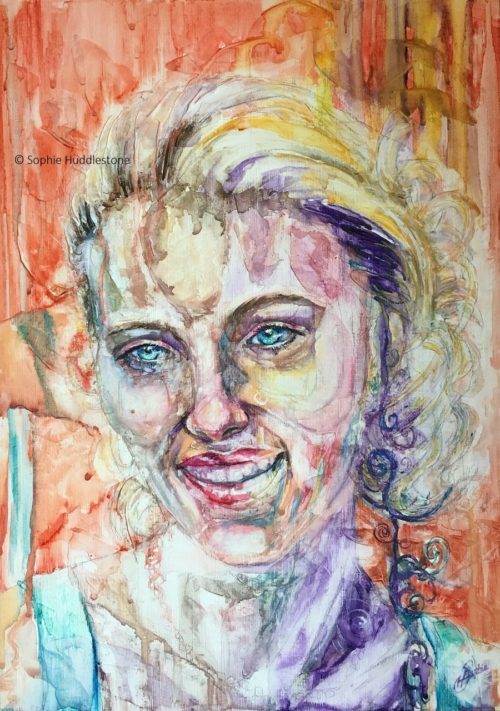 Portrait Scarlet Smile original watercolour painting on a canvas board size 420mm high 297mm wide and 1.4mm thick (16.5″ x 11.7″ and 0.1″ thick). Modern contemporary portrait by Sophie Huddlestone. Hand painted in artists quality watercolour paints. Areas of this watercolour has texture paste added which gives a raised surface 3D effect to the painting. The coating is a professional satin varnish which also gives the artwork UV protection. Unframed and unmounted. Includes a small certificate card, signed, with purchase details, which proves the authenticity of this purchase direct from me, the Artist. The copyright wording is not painted across the actual artwork, it is edited onto the display photograph. Full copyright remains with the artist, Sophie Huddlestone. Posted flat in layers of cardboard. Will require a signature on arrival. The postage tracking code will be emailed to you. A female portrait with a confident yet gentle smile. Close viewing depicts raised areas of gestural abstraction in a painterly style while remaining a compelling modern portrait when viewed further away. I wanted to capture the power of a subtle smile without a brash attitude. The addition of movement via the shoulders was formed by the paint application, almost like an artsy form of reading tea leaves. 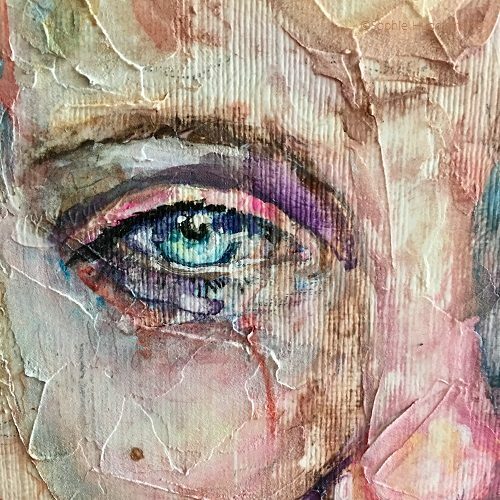 I enjoy allowing the paint to blend and move on the surface to create its own story.